We’ve just delivered an interesting project that brought a wide variety of technologies and techniques together to create a custom application for Midas Recovery Services. Midas works with insurance companies and other health care providers to recover expenses associated with Worker’s Compensation cases and has been using an aging FoxPro database for the past 15 years to manage their business. Our system collects data about every Worker’s Comp case filed in California, then looks for matches against a table of over 3 million client members. An easy-to-use AJAX user-interface provides information about each case, as well as complete case management and activity tracking tools. Midas has seen processing times go from several hours with the old system to under 1 minute with our optimized mySQL database and object-oriented PHP code. DCP Partners is hosting the application and providing on-going administrative / management services. Initial response from Midas has been very positive, as they see: significant improvements in their ability to provide service to their clients, increased efficiency of their staff, the security of hosting their core business application in a managed datacenter, and the strength of a solid technology foundation on-which to grown their business. Next on the list – a new public-facing website. When Mark Chapman at Illumination Systems Inc found that his SEO results were much less than expected – he asked us to look at the design of the site he had just paid to have developed. What we found were poorly designed content structure, missing elements, and static meta tags. Additions or edits to the content required hardcoding HTML … and lots of FTP back-and-forth. Sadly, this happens all too often when using a website-mill developer. We were able to move his content and site design into a WordPress 3.2 platform and open a whole new world of easy-to-use content management, with powerful SEO tools that provide content-specific titles, descriptions, and keywords … using WordPress and the Genesis framework. 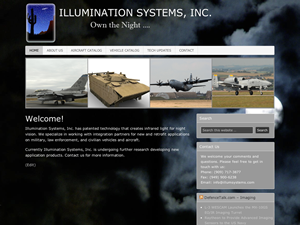 Content is still being defined and the site design will be refined over time – but Illumination Systems is now on a solid foundation for building their internet presence. One of the things I enjoy doing in my ‘off time’ is producing videos for a number of projects – primarily for our local high school band programs. 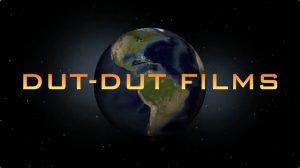 Dut-Dut Films™ is the tongue-in-cheek banner we use for these projects – “Dut” referring to the ‘verbal cue’ used by the band (primarily the drummers) to keep the tempo when they’re not playing. Legendary marching music performer, instructor, arranger, composer, and adjudicator, Frank Dorritie wrote an article about this ‘device’ recently – which may give you some insight into what a “Dut” is. 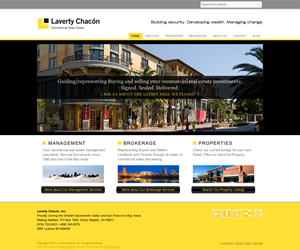 Another site we’re proud to announce is the new site for Laverty Chacón Commercial Real Estate in the Sacramento area. This was another collaborative project with Nicole Bratt of Rock+Feather Creative in San Francisco, who was responsible for the fantastic graphical design. Lisa Yaple did the content editing. 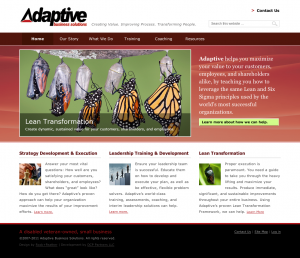 The site is built on a WordPress 3.2 platform, using the Genesis Framework as our foundation. There was a fair amount of custom code written (Google Map and custom data element ‘shortcodes’ and plugins, custom taxonomy, conditional menu selection, etc) to provide Laverty Chacón with the look, features, and functionality they wanted. In the end, they were very happy with the result and I think they have a great looking site that is easy to use and maintain … and provides their clients with a site where it is easy to find what they’re looking for. Laverty Chacón has also chosen DCP Partners to provide their fully-managed hosting and system administration services. I’ve just completed registration for WordCamp O.C. – which will be held at Chapman University in Orange, CA on May 14th. WordCamp is a day-long gathering of WordPress designers, developers, integrators, bloggers, and devotees – where ideas, methods, and all sorts of creative things are discussed. I attended the WordCamp in LA last fall, which proved to be invaluable for me. If you’re in SoCal and have any interest in developing on the WordPress open-source CMS platform – you should try to attend. Time to get your geek on. 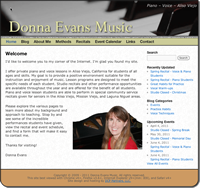 We’ve recently migrated a ‘hard-coded’ website we developed a year ago for DonnaEvansMusic.com to a WordPress CMS site. Donna provides piano and voice lessons in Aliso Viejo, CA and wanted to achieve better ranking on Google, Yahoo, Bing and other search engines. By moving to WordPress, we can keep a sitemap updated automatically, leverage the intrinsic SEO capabilities of the system, add an easy-to-maintain Event Calendar, and provide her with the ability to publish a blog that her students and others can follow. It wasn’t all that long ago that I looked at WordPress as a service for those that had lots of spare time on their hands and whiled-away the hours transcribing their every thought into their blogs. I suspect that same opinion was held by ‘serious’ content management system (CMS) users and developers. When I re-launched the DCP news-site about 5 years ago, we used Joomla – which was (and still is) one of the better-supported CMSs around. WordPress 3.1 was released this week and, while I’ve been running the release candidates from RC3 forward, I’m excited about the possibilities I see for this system. We’re able to produce high-quality, easy-to-use, easier-to-maintain solutions for our clients in less time – resulting in better productivity and value for everyone. If you’re interested in upgrading your present static website to a client-driven CMS-based site – let’s talk about your application. We’re finding that there are few things we can’t do with this platform.